I realize after the fact that Portees are unarmoured tank teams, so cannot launch assaults, but this was the first (and last) time I would ever assault with them! Great video and commentary. 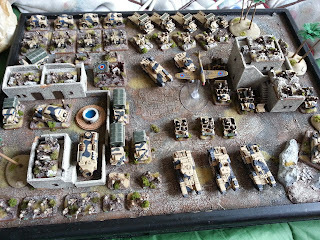 That is one cool looking MW Brit army and list. Good luck to you both in the tournament. Yeah these games are always fun. It seems Varnish and I always take turns winning each week....I did end up doing pretty good with this list at the tournament we went to, so I am happy with the way it's put together. Paras, Tigers and Fights, Oh My!